… except for the year our family dog jumped up on my bed and devoured my Cadbury’s chocolate hollow egg. Fortunately for the dog, it was a milk chocolate egg, and he suffered nothing more than a bout of diarrhea, but I was outraged, because this year, I had been planning to savour it, breaking off the octagonal shaped bits, day by day. It was always Cadbury’s chocolate in our house, and through my childhood I thought it was the best, because that’s what my Mum told me. Maybe it was better “way back then in days of yore” as my students like to tease me, when I talk about my childhood, but these days my palate seeks something a little different, if I am going to indulge in any Easter treats. 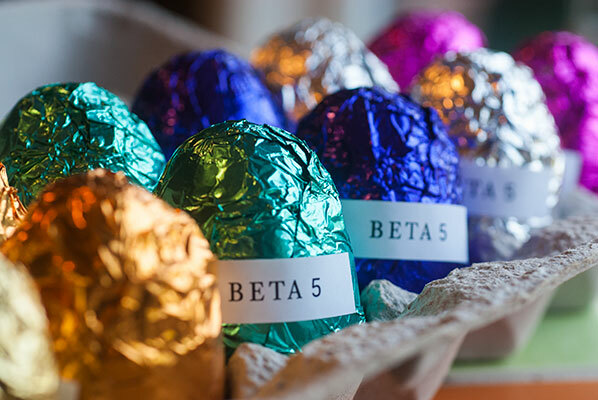 I was delighted when last week, my intrepid partner, Younger Son and I, while on an entirely different errand, made a not-really-scheduled-but-we-are-in-the-neighbourhood-pit-stop and stumbled upon the “way cool” Easter offerings at Beta 5 Chocolates in East Vancouver. As one of our teenaged friends must not consume wheat gluten or dairy products, I was thrilled to see they have created a whimsical version of the otherwise inedible (in my opinion, though the teenagers in the house disagree) marshmallow Peep. 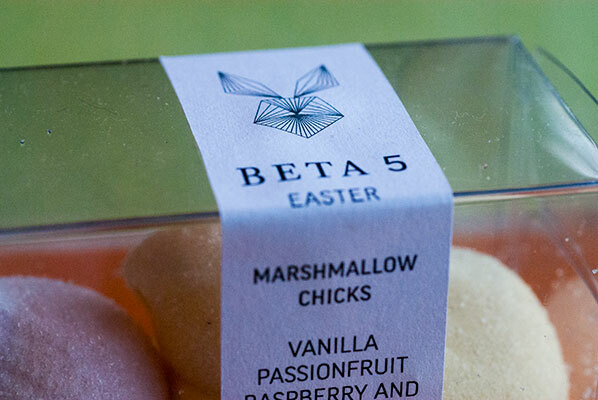 Named Chicks, these confections come in a box of four, flavoured with vanilla bean, caramel, raspberry and passionfruit. 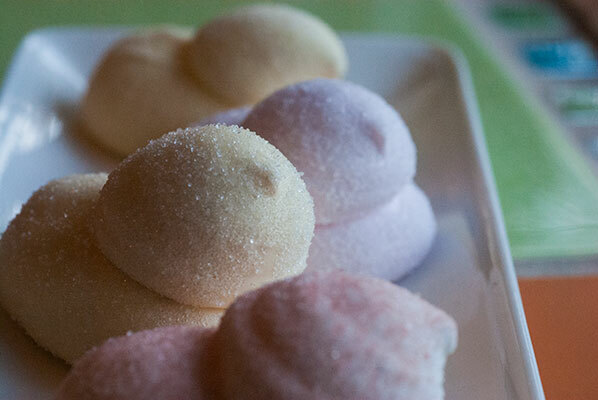 I grab two boxes – just in case they taste as good as they look (a delicate pastel rather than neon), and we need to keep one for ourselves. 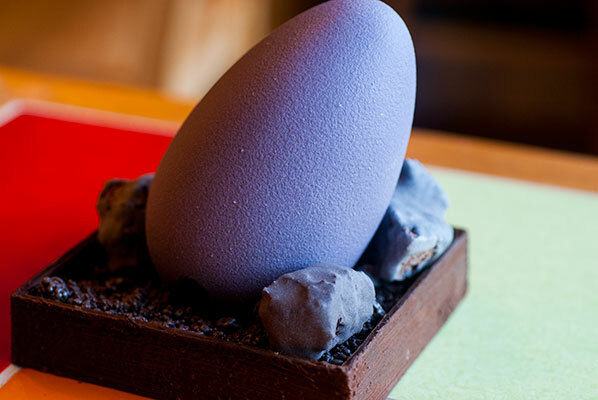 A Komodo Dragon Egg – hand-painted dark chocolate, filled with 6 peanut butter quail eggs and milk chocolate-covered raisins, buried in a nest of dark chocolate-covered pop rocks. 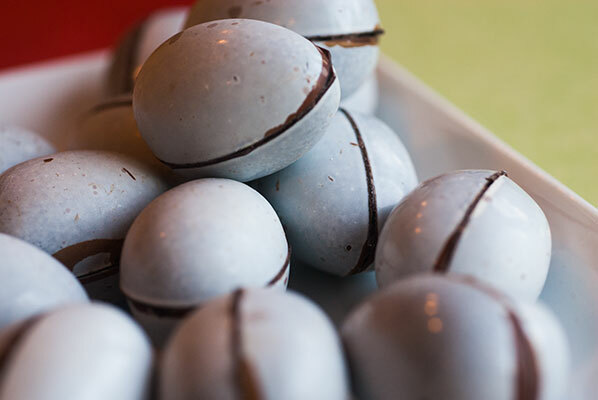 One dozen Pebble filled Eggs – with fillings including: milk chocolate raisins, dark chocolate cherries, dark chocolate DuChilly hazelnuts, dark chocolate Marcona almonds, milk and dark chocolate malt balls, and marshmallow chicks. A bag of whole freeze-dried strawberries, coated in a layer of 63% dark chocolate and ruby dust (this was not really from the Easter line, but were snuck in, anyway). Oh well. Easter comes but once a year. And these do look amazing, as you can see from the pictures. 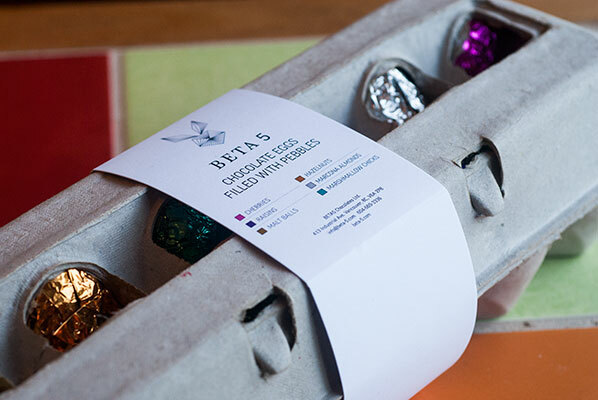 From the sneak pre-Easter taste tastes, my favorite of the Beta 5 treats are the Quail’s Eggs. 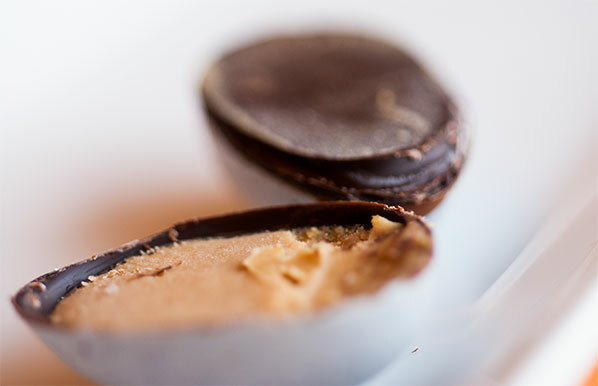 The light, thin shell smashes satisfyingly as you pop one in your mouth, giving way to a generous, not too sweet/slightly salty peanut butter centre. More-ish, as my British relatives would say, and I confess to eating half a bag of these while writing this blog entry. The Chicks, according to our friend and Elder Son, have a nice frothy consistency, but so subtle in flavour as to be almost indistinguishable from each other. Marshmallow-y, but not much else. Not necessarily a bad thing – but I was looking forward to a good hit of passionfruit. My Intrepid Partner needed to open a couple of the pebble filled eggs, in order to photograph them , so we were able to taste the malt balls -“ really really good, crispy” and the cherries – not overly cherry tasting, subtle. The cherries are unsweetened, sun-dried and taste almost like a big raisin, in a good way. We plan to use the Komodo Dragon Egg as an edible centre piece for our holiday meal. Although nowhere near the artistry and expertise of the skilled people at Beta 5, I did make a few homemade Easter treats. 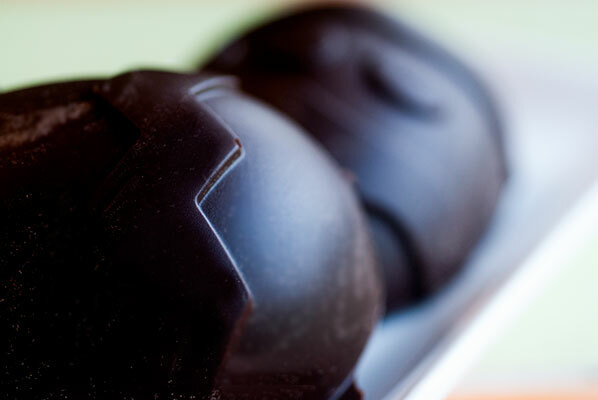 On the last trip to my local chocolate supply store, I picked up a sweet little poly-carbonate egg mold. 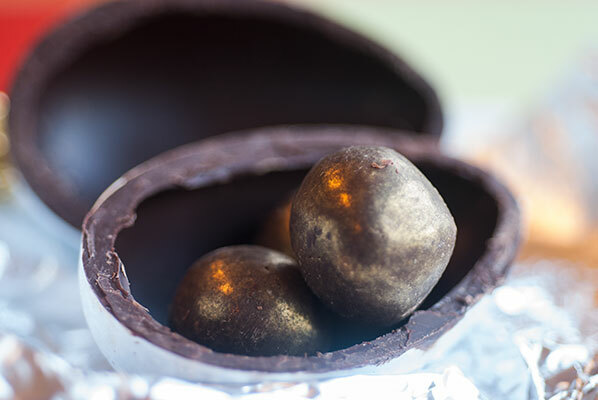 The cavities in it are quite shallow, so I was content to do a batch of good dark chocolate and a batch of milk chocolate solid halves, which when put together, made nice small solid chocolate eggs, in either all dark, all milk, or some half-and-half. 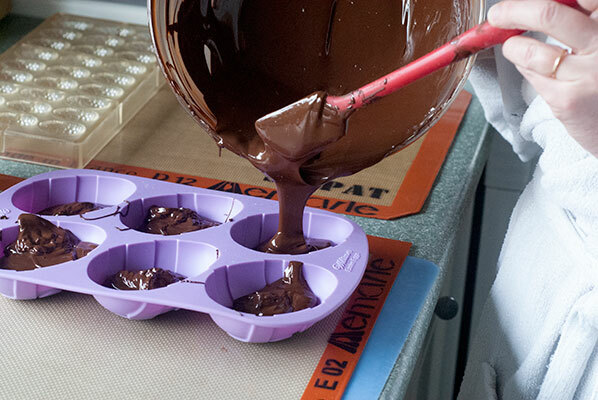 I then coated the cavities of a deep silicone mold (which is really meant for cupcakes, but works for chocolate, as long as the coating is thick enough) with a layer of tempered chocolate. Instead of the technique used with rigid poly-carbonate molds I spooned the chocolate into the centres, then painted it up the sides with the back of my spoon, to the edges of the mold, allowed it to set, then painted on another layer, to avoid the cracks I encountered when I tried a similar feat last year. The challenge was to get a good covering, without being so thick as to break teeth when bitten. 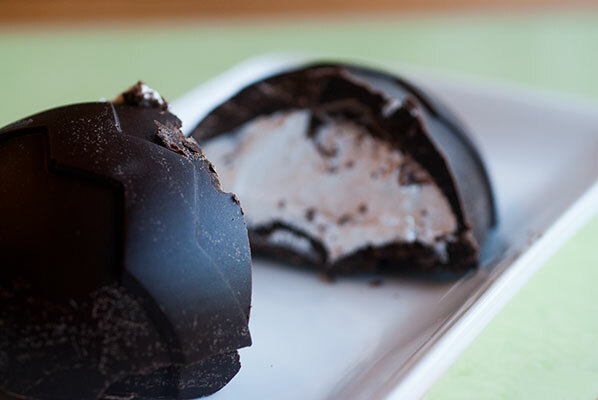 Once the second layer of chocolate had set, the generous cavities allowed me pipe in a good portion of marshmallow filling, and after allowing them to sit for five minutes, I applied a backing coat of tempered chocolate. 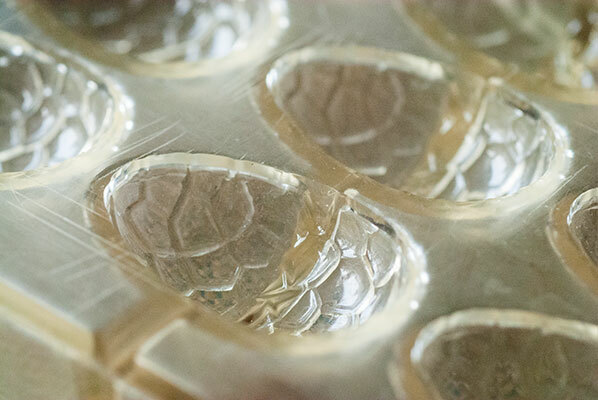 Easing the sides of the silicone mold, once the chocolate had set, the eggs popped out easily. And I have to say, they taste pretty fine. We had to sample one, of course, to make sure they were fit for our sons and friend to consume. I am looking forward to hiding all of these treats, if they make it to Sunday. This has proven to be a slight issue, as we are keeping them in our bedroom, and the smell of all that chocolate is heavenly, but enticing. So, while I am sure it is helping me get to sleep by the deep inhales of delicious scented air I am breathing in, it is also impossible to ignore, if one should wake up a bit peckish, in the middle of the night!